Ventilation methods: Ventilation is the provision of a supply of fresh untreated air through a space. Natural ventilation occurs when changes in temperature or air density cause circulation in the space. 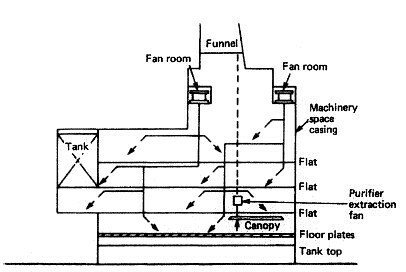 Mechanical or forced ventilation uses fans for a positive movement of large quantities of air. Natural ventilation is used for some small workshops and stores but is impractical for working areas where machinery is present or a number of people are employed. Forced ventilation may be used in cargo spaces where the movement of air removes moisture or avoids condensation, removes odours or gases, etc. The machinery space presents another area which requires ventilation. As a result of its large size and the fact that large volumes of air are consumed a treatment plant would be extremely costly to run. Several axial-flow fans provide air through ducting to the various working platforms. The hot air rises in the centre and leaves through louvres or openings, usually in the funnel. The machinery control room, as a separate space, may well be arranged for air conditioning with an individual unit which draws air through trunking from the outside and exhausts back to the atmosphere.